Implications. People never think about implications. Immortality was one of those things people talked about wanting, talked about needing. Of course, who doesn’t want to live forever? I’ll tell you exactly who: everyone who is living forever. Sure, it seemed like a great idea for a few centuries, but then the ennui kicked in. Eventually there’s only so many time you can do everything you always wanted to do. And in the end there’s only so many people to do things with. After everything else is exhausted, all you can do is wander, and hope to find something new. We left earth. Let it become what it wanted to be. Let it heal, gave something else their turn. I heard of someone who went back. I guess that was several million years ago now if there still was an earth to go back to. He said cuttlefish had taken over, filled all the spaces that we’d left behind. Good for them, I suppose. In the end, it was like learning that someone had repainted a bedroom in the house sold years ago. Any sentimentality I had for that old place left longer ago than I could really say. Anyway, after the first billion years, time feels rather immaterial anymore. We wandered. And we waited. There were others out there, those who had made our mistake, and those who hadn’t. At least not yet. I tried to dissuade a few planets, told them what a mistake immortality had been. They just called me unimaginative. I guess there are some mistakes people have to make on their own. Touching a stove hurts. Falling in love leads to heartbreak. Immortality leads to meaninglessness. The universe continued on. And we waited. Finally, we congregated again. We were brought together, those humans who hadn’t found a way out, those aliens who had joined us in folly. We were brought together around the last star in a cold and unfeeling infinite. The universe was running out of energy, running out of stuff. All that remained were scattered molecules and this one star, burning hot and bright as it swelled towards a super nova. It was something to do, and then there would finally be nothing. And we waited. Right up until the end. I remembered a feeling, a sensation I’d left behind so long ago. It was anticipation. It was hopefulness. The star burst forth with a magnificence that stunned us all, then rapidly contracted into a dead mass. No energy. No heat. We were so hopeful that the universe would take us with it. That heat death might finally give us release. Fortnightcaps are biweekly experimentation into short form fiction. All Fortnightcaps are licensed under a Creative Commons Attribution-NonCommercial-NoDerivs 3.0 Unported License. So if you like the story, please feel free to link people back here. And if you didn’t, maybe the one in two weeks will be better. 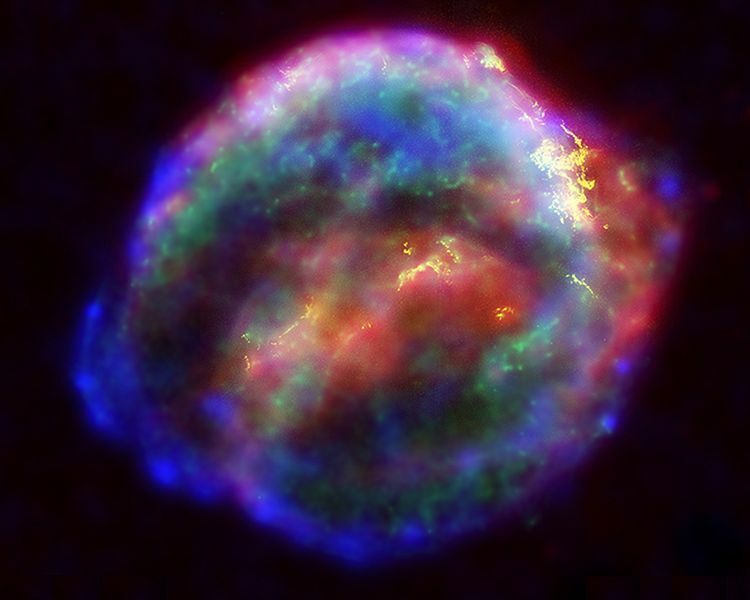 Picture of Kepler’s Supernova courtesy of NASA, released to public domain.